Quaking Apen is a member of the Willow Family. 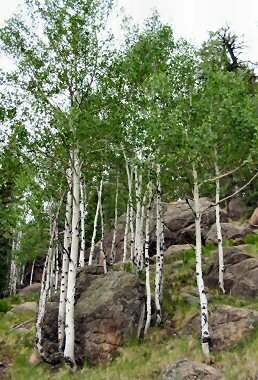 It typically appears as a slender tree with white or yellow bark which usually grows in groups to a height of up to 80 feet (though is more typically around 40 feet tall). Leaves are bright green, shiny and roundish with saw toothed edges. The tree typically grows in Ponderosa pine and spruce-fir forests at elevations between 6500 and 10000 feet. 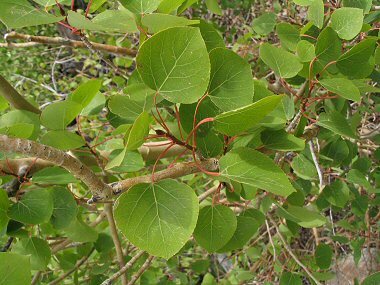 Quaking Aspen gets its name from the fact that every little breeze causes the slender, flattened leaf stalks to tremble. Quaking Aspen typically blooms in the spring, before leaves form, and produces tiny inconspicuous flowers followed by cottony seeds on female trees (male and female flowers appear on separate trees). The leaves of the tree are browsed by deer and elk and the wood is a favorite of beavers.